New Year’s Eve Tea Cocktails! Dearies, what are your New Years Eve plans? Whether you have a quiet night at home or a big soiree with all of your friends, you can still create special celebratory moments that feel personal and meaningful. Kat’s going to have a small group of friends over, and she’s planning on serving a few select tea cocktails along with some decadent nibbles. On New Years Eve, it’s important to bring out the bubbly! Use champagne, sparkling wine, or sparkling cider to add your bubbles. With a bit of sparkly fizz, you’ll create a classic convivial spirit to your evening. For a bright, jasmine scented drink, add a bit of jasmine tea to your bubbly cocktail. A great way to add strong tea flavor to your drink is to infuse vodka with tea. Vodka is a very neutral flavor on its own, and works very well as a base for your tea. Use a clean bottle with a stopper at the top. A bottle that holds most of a 750ml bottle of vodka will work perfectly. Add about 6 teabags to the bottle, shake gently and let it infuse for a few hours, or even overnight. Try not to let it sit more than 12 hours, the brew can get a bit bitter. Once your jasmine vodka is ready, add about 2 tablespoons to a champagne flute or coupe, and top off with your bubbly of choice. A dash of elderflower liquor would make a lovely nuanced addition, but isn’t necessary. If Jasmine tea isn’t to your liking, you can use any kind of tea you wish. The options are endless. Adding a bit of Darjeeling, the ‘champagne of teas’ to your drink will create a cocktail fit for royalty. 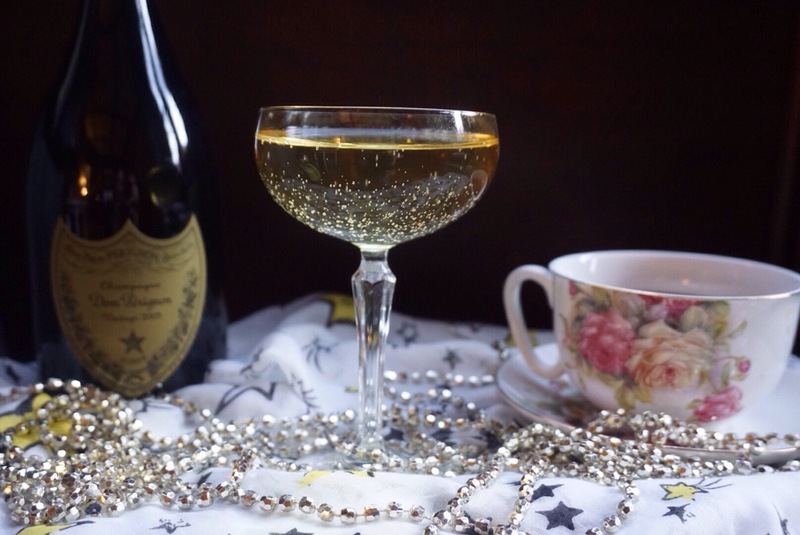 Kat is eager to try this Darjeeling gimlet for an old-fashioned twist to her New Year’s Eve. It’ll give a classic ‘Great Gatsby’ air to your soiree. It’s especially fun if you have a 1920s theme to your party. Or for another classic cocktail with a tea twist, how about a matcha gimlet? Your matcha-loving friends are going to adore it! Whatever your drink choice, I hope you all have a fun, festive New Year’s Eve! What drinks are you planning on serving? 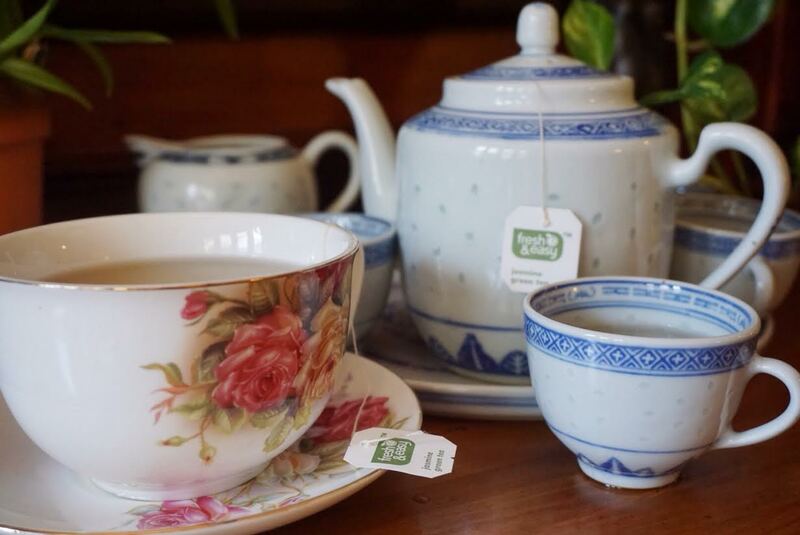 Dearies, I’m sure many of you have heard of jasmine tea, but do you know the story behind it? It is the world’s first known scented tea, and continues to be extremely popular. The flowers were first brought to China from Persia during the Han Dynasty (206 BC to 220AD) and were soon added to tea for the wonderful flavor. However, it started to become popular in the Qing Dinasty (1644 to 1912) when the tea was exported to the West. Jasmine tea is typically made with green or white tea. It tea can be found as traditional leaves, or wrapped into little ‘pearls’. The irresistible floral aroma is a perfect complement to these vegetal, nutty teas. Traditionally, to create a jasmine scented tea the blooms are picked during the day, and layered over the processed tea leaves in the evening. Jasmine flowers are extremely fragrant, and bloom at night (isn’t that romantic?). The fresh blooms scent the tea they’ve been incorporated with. Freshly processed tea leaves are very absorbent, and soak up the beautiful scent. The flowers are left with the tea for many hours to develop a complex floral flavor. The tea is then fired to dry it out after absorbing the moisture from the fresh flowers. Jasmine oils may also be used to flavor the tea. Kat first tried Jasmine tea at a Chinese restaurant as a child. Now that she has a home of her own, she keeps a box of this Fresh & Easy Jasmine Green Tea in the house at all times. She was happily surprised to find this tea in her local grocery store, and it has been on her shopping list ever since. It is the perfect lift for a quiet lazy afternoon. It is also wonderful to relax with after a hectic morning. As soon as you open the individually wrapped tea bag, the luscious jasmine aroma hits your nose. The steeped tea is a perfect combination of mellow, vegetal and sweet. The green tea flavor is clean and simple. Calming and gentle, instantly relaxing. The jasmine flavor is floral, beautiful, but not too strong. The flavors all work in harmony. Kat enjoys this tea both hot and iced. The floral flavor holds up well to both preparations. Have you tried jasmine tea? How do you usually prepare it?